The importance of airport security has been proved during decades, being no longer a matter of discussion, and every now and then, when a bomb goes off somewhere in an airport or on a plane, the whole world will turn its eyes on the miserable lesson and learn how to protect ourselves in a better way. Click into the walk through metal detector category and have a careful visit on this 33 zones arched door metal detector, it has been the necessity in every airport to install such device. You must be shocked by the news that the horrible terrorist attacks in Brussels, mainly the one at the airport, put the existing model of Aviation Security under harsh scrutiny and restarted, with renewed energy; the topic of the security concept has been the hot topic once for a while. The importance of airport security has been proved during decades, being no longer a matter of discussion, and every now and then, when a bomb goes off somewhere in an airport or on a plane, the whole world will turn its eyes on the miserable lesson and learn how to protect ourselves in a better way. In term of the airport safety issue, one professional online store will highly recommend this www.detectorall.com where focuses on producing the security check equipment. 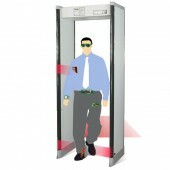 Click into the walk through metal detector category and have a careful visit on this 33 zones arched door metal detector, it has been the necessity in every airport to install such powerful and useful walk through metal detector to protect our safety. Reading more horrible airport terrorist attack news again the references to such attack in many articles written these days, some say that it is because the shortcoming of the security equipment, or some people blame that the security check is so careless that leads to the happening of the attack. Stop complaining and buy the high quality 33 zones arched door walk through metal detector. It will be the key to keep airport in security and is mainly used to check the hidden metal objects on the body of passengers. Especially in the airport when inspectors walk through the security gate, and carried the metal objects which exceed the default weight, quantity, or shape, the metal detector will alarm. And it is obvious you can find out the hidden terrorist easily.